Infographics have been around for some time now. If you are an online marketer, you have no doubt seen them, possibly even used them in your content marketing strategies. Unfortunately, many today are attempting to capitalize on the success of infographics and infographic marketing, but they sacrifice the quality of the infographics they are producing. The result is an over-saturation of low quality infographics. This is where a well-designed, resourceful infographic can stand out from all the others. But how does one go about creating an infographic that is going to get the attention of many and result in a positive ROI? 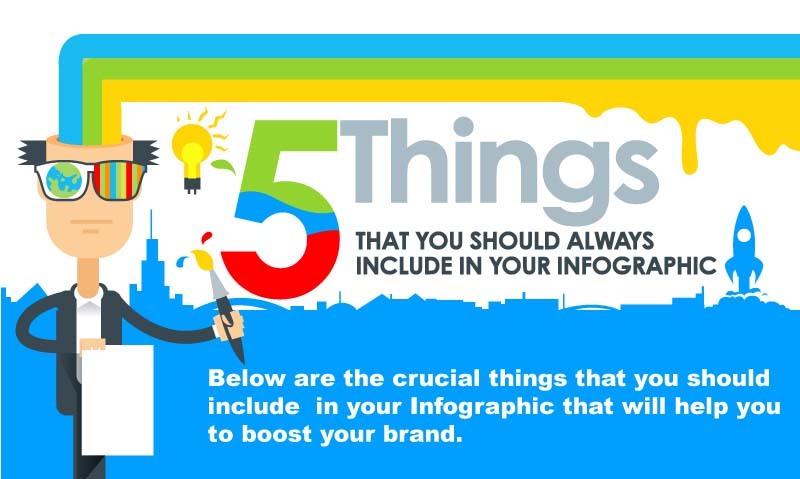 In the following infographic, InfoGraphic Design Team looks at 5 important things to always in your infographic. I have also included the textual version below the infographic itself. Below are the crucial things that you should include in your infographic that will help you to boost your brand. People expect good visuals when they are looking at an infographic. Use colors that attract people such as blue, purple, red, and other colors that draw the eye to your message. The placement of the various graphics is important too. If you have old data that is no longer relevant, this could reflect negatively on your brand or your message. Focus on creating important information that will resonate with your viewers.